I visited Ness Gardens for the first time this summer. Ness is on the Wirral and the gardens offer fantastic views over the Dee Estuary. My interest though, lies in the planting. I love to visit gardens to get inspiration and to earmark more plants to squeeze into my tiny plot. Here are some of the gems I found. This eryngium is one of my favourite coastal plants – I saw it growing wild in Mallorca, but don’t think it looks out of place in a summer border. 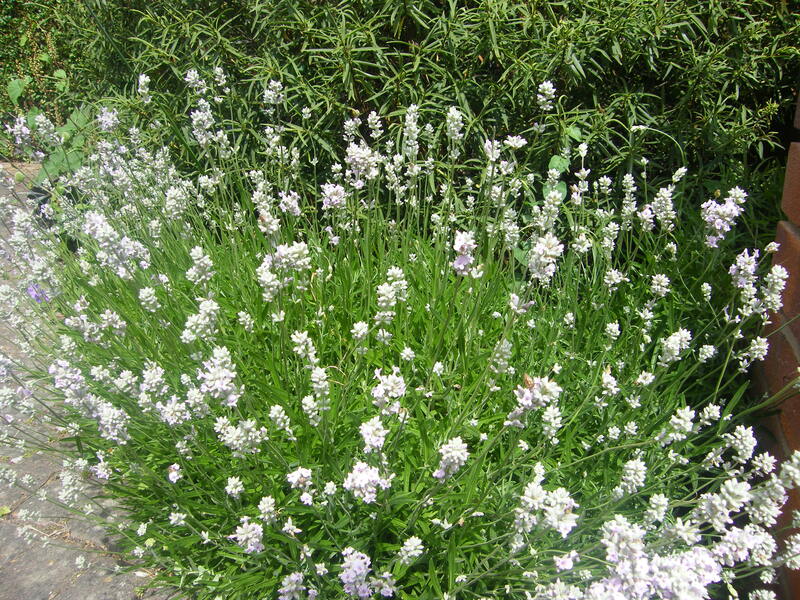 I have mine at home planted next to verbena bonariensis as both are architecturally interesting and work well together. I don’t have an echinops in my garden, but I think it’s time to acquire one as the bees love them and to be wildlife friendly is one of my main garden objectives. I don’t actually know what this plant is, but it certainly makes an impact. Wouldn’t work in my small space though. Finally, the scent of this philadephus was amazing and is a definite must buy. I already have a jasmine which is flowering beautifully, but I could squeeze this in somewhere higher up the garden so that the two plants don’t steal each other’s limelight. I must go back to Ness in the spring and see what pops up in the way of bulbs! 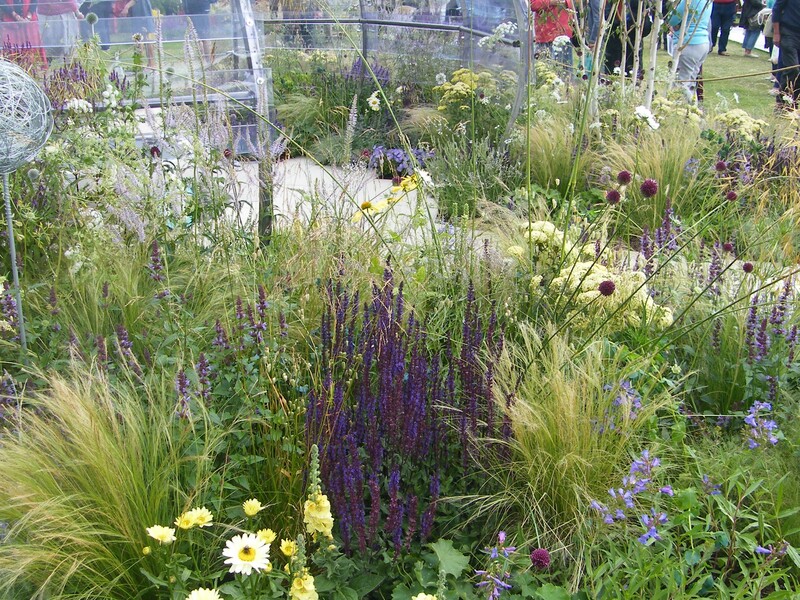 Some gardening inspiration from this year’s RHS Tatton. 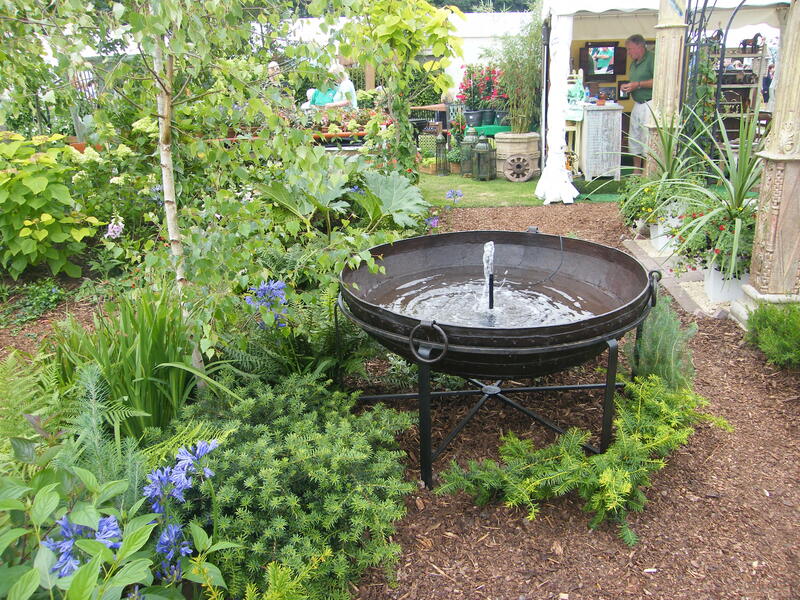 I loved this little water feature – so simple but very effective. This caused some serious greenhouse envy! Our own bit of Tatton in the shopping trolley ready to roll home. The salvia Hot Lips scented our journey! I’m inspired to replicate this pretty little garden bench in my own garden. Another fab year for the show! I’ve been admiring circular lawns on pinterest for a while so this weekend I thought I’d have a go. After measuring eight foot across, Steve and I dug out the circle and patched up the holes made by treading on the lawn over the winter, while it was still a quagmire. I’m thinking I may have a runner bean wigwam in the front left corner, but I’m not sure yet what else to plant. Definitely medicinal plants and herbs and maybe some other veg. It’s not shown in the photo, but we also laid a connecting path leading to the bottom garden. The effect I’m trying to achieve is a working kitchen garden at the top and a quiet place for reflection at the bottom where I have planted roses and jasmine. First and foremost though, this is a nature garden, so it will never be over manicured, things will be allowed to set seed, and there are lots of trees and shrubs for our resident birds. Some garden inspiration from today’s visit to Tatton. I was quite taken with this water feature – not too fussy. 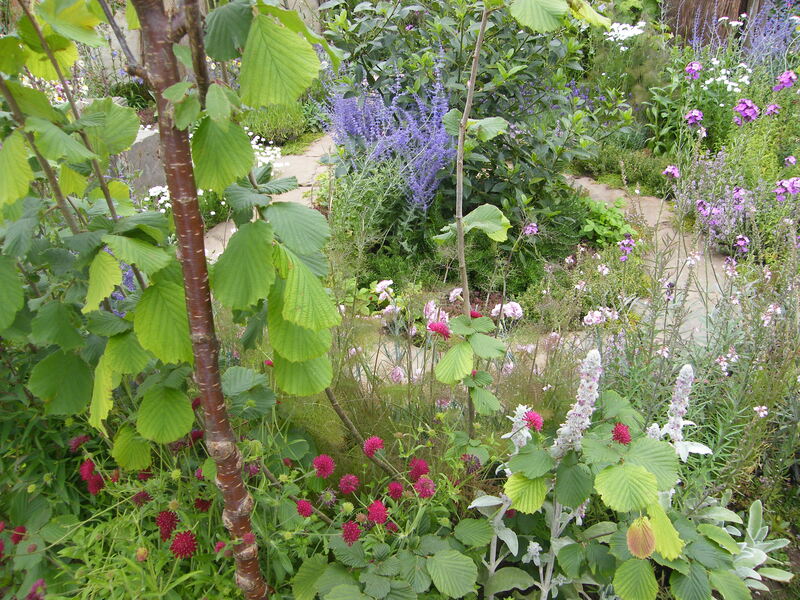 Loved the dense planting in this one. Quite a few blue sheds – this looks good against the crocosmia Lucifer and white agapanthus. 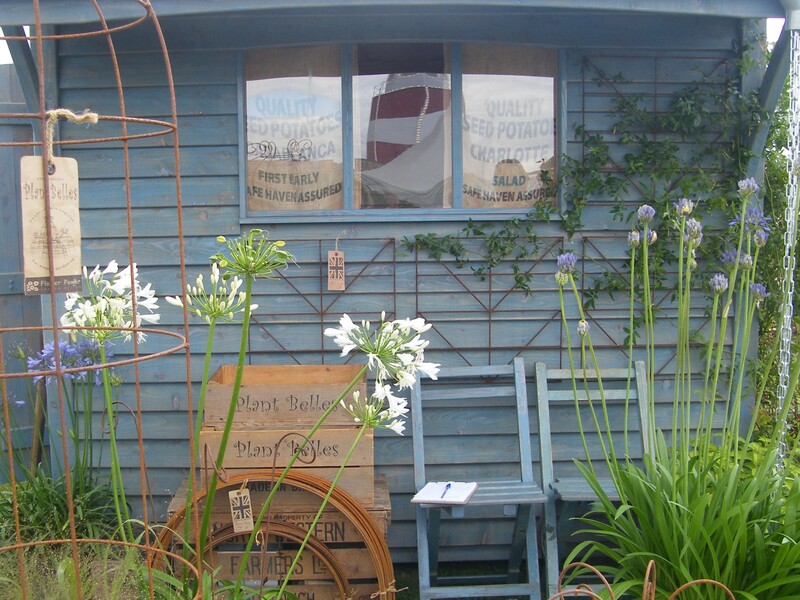 This is a bit like my shed, so I bought some of these white agapanthus to set it off – I will have to find some old crates to stencil and pile up outside. 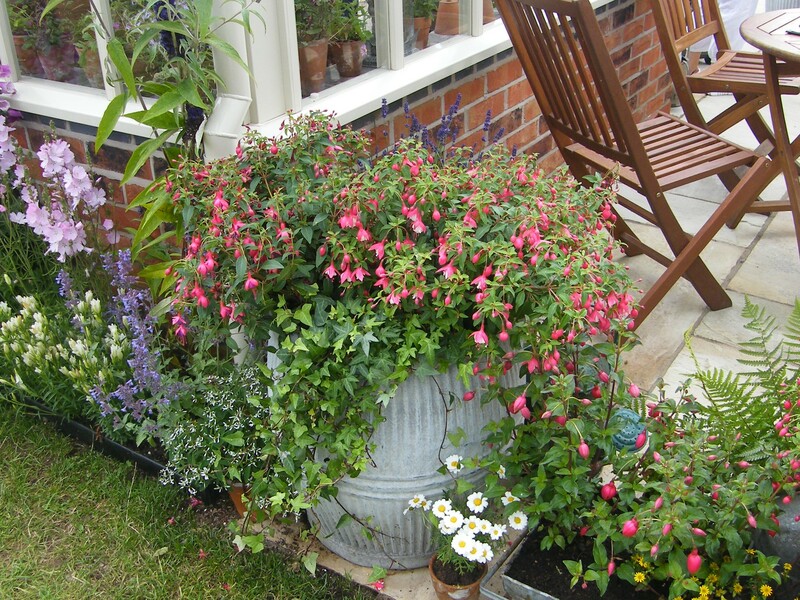 This fuchsia looks so good spilling out of an old metal bin – definitely an idea I could use. There were lots of grasses this year – I love the way the drumstick alliums are planted through here. I’ve come away with lots of ideas, some fig compote and a few plants, including some lavenders, an echinacea, some agapanthus and an osteospermum – so guess what I’ll be doing tomorrow. I was very tempted to buy a fig tree but thought better of it! Anyone else been? What did you think? Since I last wrote about the importance of aromatherapy in my life, I’ve been inspired by some wonderful medicinal herb gardens and have made some decisions. Aromatherapy massage is just a very small part of this huge world and it’s one that I won’t be venturing into. Instead I plan to bring aromatherapy into my kitchen and garden! 1. Grow as many medicinal plants as I can fit into my tiny plot (I already have quite a few but it’s an excuse to buy more plants I know). 2. Experiment with more essential oils in candles, scrubs, lotions etc. 3. More research on plants and their uses. RHS Tatton next week here we come! 4. Make beauty products with herbs and flowers. I know that I’ve finally found the right path on my aromatherapy journey and I look forward to sharing it with you. There’s very little sun in our garden, but the side of the house is bathed in sunshine for a good part of the day. so for the last few years I’ve been growing veg in pots. Now, don’t laugh, I know it looks like a right old jumble that could give Steptoe and Son a run for their money, but based on previous years, it seems to work. 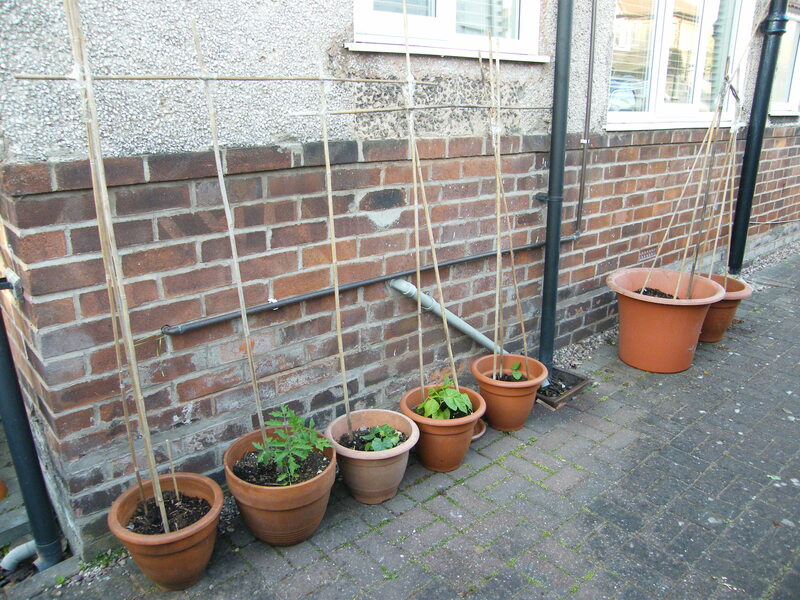 The compost is home made, and in the pots I have runner beans, cucumber, yellow courgettes, sweet peas and tomatoes. Time will tell how they do. I don’t have a greenhouse, so the beans, sweet peas and courgettes are sown direct, the tomato was donated by my sister and the cucumber bought at a church fair as a small plant. Never grown a cucumber, so anyone’s guess what will happen. Runner beans have always been a great success grown this way and I love it when I can pop outside the kitchen door and harvest them any day of the week in late summer. Anyone else using pots for veg?